The Ochre Star is a wonderful subject at low tide. You will often see them near mussel beds since it is one of their sources of food. I prefer mine steamed, thank you! The stars can be orange or purple or brown. When the tide goes out, their skin and arms become stiff and hard for protection from predators. Occasionally they will get stranded on the sand and then they can be easily moved into your “frame” without hurting them. Usually for low tide photography I like to carry as little equipment as possible so I don’t accidentally knock an expensive lens or two into the water. 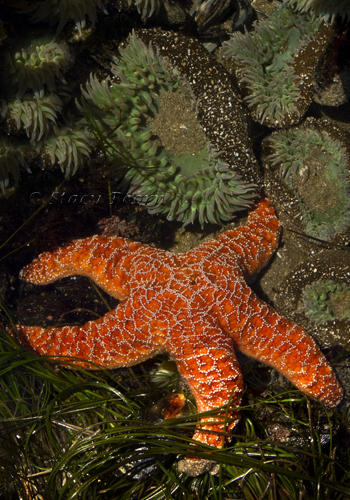 Often you need some sort of diffusion for tide pools to eliminate some of the reflections and glare on the water. (Camera Body, 18-200mm lens, Polarizing filter, tripod,). But if you arrive in the morning when the sun is still relatively low you might be able to get a good angle on a shallow tide pool as you see here. Use your polarizing filter to reduce as much reflection as possible. 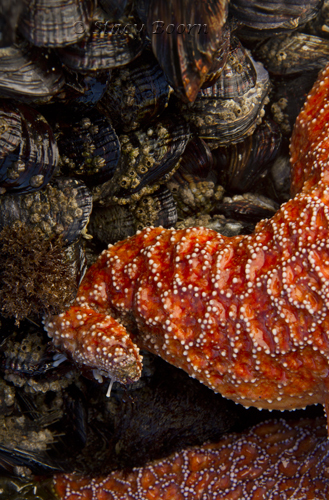 Look for shallow tidepools, perhaps where the sea star is not fully immersed. The sun also gives the giant anemones their neon green look. You get this angle best by being pretty low to the ground/water, so a gardening kneeler is helpful for your knees or tushie. The giant green anemone is one of the most spectacular animals you can find in the tide pools along the Pacific coast. Giant green anemones live on the rocks of tide pools and in deep channels on exposed rocky shores. They can also be found on concrete pilings in open bays and harbors. From Alaska to Panama, these anemones flourish in the intertidal and sub tidal zones. These large anemones like to eat detached mussels, crabs, sea urchins and small fishes. Their predators include sea snails and sea spiders. In honor of Cinco De Mayo I offer you an Iris image. 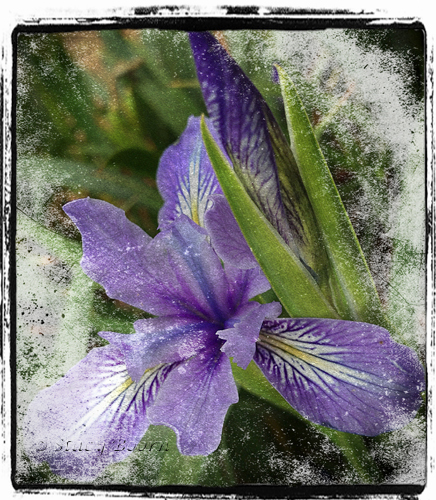 An Iris is a flower that denotes “message.” May is a wonderful time to hear the messages around us. Remember how Dolores Huerta co-founded with Caesar Chavez the United Farm Workers. In 1966 the working conditions in the fields were very bad. Caesar Chavez considered a potato boycott. But Dolores Huerta said that in California it would make a greater impact to boycott the grape. By 1970 the grape industry signed an agreement to improve wages and conditions for the migrant farm workers. Hopefully this empowerment will continue to places and people still needing justice. Think of the garment workers in Bangladesh. Since I am wearing a purple printed blouse, the message of the Iris may be: pay one dollar more per cheap garment so that conditions and wages will be improved for the mostly-women-workers in the factories that supply us with reasonably priced and beautiful clothes. This entry was posted in Weekly 2 and tagged green anemone, Iris, Ochre Stars, tidepools. Bookmark the permalink.